The Arrow is an advanced state of the art lightweight reconnaissance/Surveillance ISR Ultra Ruggedized MIL-STD 810F next generation digital multi purpose multi sensor hand held/pan tilt zoom PTZ Thermal Imaging, long Range CCTv Tactical binocular system with laser rangefinder and GEO custom features. If your application calls for a Multi Sensor thermal FLIR binocular with Extreme reliability and ultra Ruggedness, The Arrow imaging system is a prime solution. The System Incorporates an ultra sensitive Thermal imaging detector with lens options, zoom CCTv LLL CMOS camera, GPS, LRF Laser Range Finder, image stabilization, 3G Pan Tilt Tactical remote sensing, DMC Compass, IR Laser Pointer, and image storage all in a sealed IP67 MILSTD 810F robust chassis with crisp bright OLED micro displays which offer the user a crisp immersive dual eye binocular screen. The unit is simple to operate, turns on instantly and has intuitive fast toggle menus. The ultra long life 10 hour battery assure long life uninterrupted security and surveillance imaging. The Arrow is the most rugged/reliable thermal multi sensor system available. The Arrow can also be easily used as a PTZ (Pan Tilt Zoom) Imaging payload for remote observation in fixed, tactical, marine and mobile applications. the Arrow is an affordable solution that leverages top grade sensor technologies which offers you the absolute best image quality & optics available today. When looking into the immersive dual eye oled display of the arrow, you are guaranteed to enjoy high grade image quality even when viewing for long periods of time, specialty optical coatings relieve eye strain. There simply isn’t a better lwir (Long Wavelength InfraRed) maintenance free multi sensor thermal binocular choice anywhere. Long range thermal binoculars are a prime choice for many military, law enforcement, and homeland security professionals, typically the use of a dual eye binocular or biocular system is preferred over single eyed monoculars due to the enhanced image presentation to the users eye. HD high resolution Oled micro displays offer big screen style immersive viewing capabilities which is pleasant to the eye and Aids in reduced eye strain and fatigue. SPI has many standalone long range thermal Flir binoculars with multi sensors giving multi spectral imaging capabilities. Day and night vision cameras along with geo locating sensors and ir lasers are added to compliment the overall system and increase its capabilities, today’s top tier SPI thermal binocular observation/reconnaissance and detection systems have up to a dozen sensors and detectors added into a single platform. 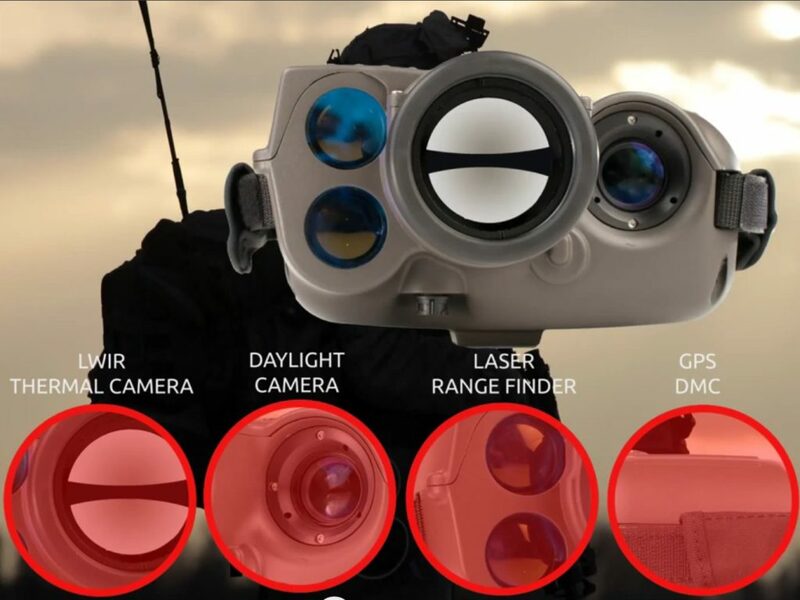 The Arrow long range thermal binocular surveillance imager is a rugged & lightweight combat optic system made to be integrated into any tactical situation. This system features a LWIR uncooled thermal sensor, a near infrared (NIR) sensor, and eyesafe laser rangefinder and an integrated GPS system with a digital compass to ensure maximum situational awareness & combat operation effectiveness. The Ultra lightweight unit has a ruggedized housing making it perfect for any battlefield situation. It comes with a soft, padded carry case that makes it easy to transport with your gear, and its operation is so quiet it’s undetectable at 10 meters. The Arrow long range thermal FLIR surveillance binocular is the worlds least expensive multi sensor imaging system .